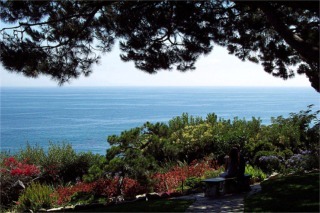 These pictures were taken on a drive we did in Palos Verdes. 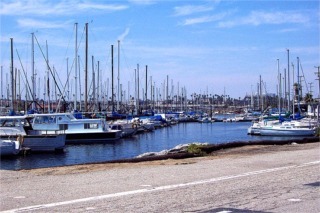 We went to San Pedro and the Ports of Call for lunch. It was a market where you could go to all kinds of seafood vendors, buy your seafood raw, then they had places to cook it for you. 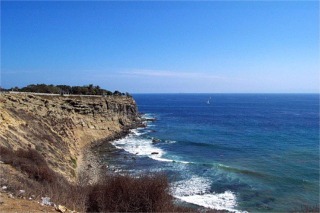 This photo is taken at Point Fermin. 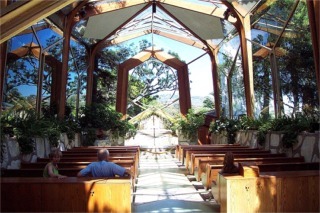 A view of the inside of the Wayfarer's Chapel. This was built by Lloyd Wright. He is the son of Frank Lloyd Wright. The chapel is open to view and enjoy. However it frequently has weddings like it did this say. So, we had to leave to allow a wedding party to come in. This is a view of the grounds looking out the door of the chapel. The views were breath taking. This view is looking towards Redondo beach off in the distance. 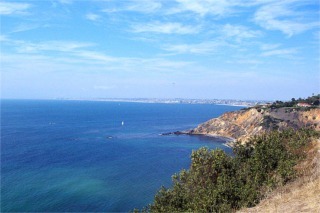 The drive along Palos Verdes is some of the prettiest coastal views we have seen in Southern California. Too bad real estate here is so expensive.